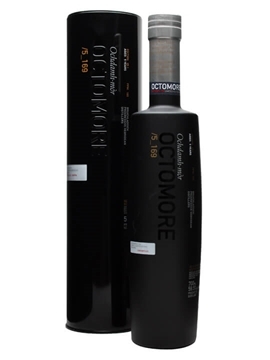 Octomore is Bruichladdich’s contribution to the ‘peat-war’ going on on Islay right now. It all started back in 2009 when both Ardbeg and Bruichladdich started peating their whiskys to hell and back, and since then there’s been an ongoing rivalery on which of the distilleries can bottle the peatiest whisky with the highest ppm. Looks like Bruichladdich is winning ppm-wise, but having tasted both I find the Supernova from Ardbeg to be a bit peatier on the nose and palate. But then again, what does it matter!? It’s not about phenol parts per million, but about enjoying what’s in the glass whether it’s peated or unpeated. So let’s get on with the review..